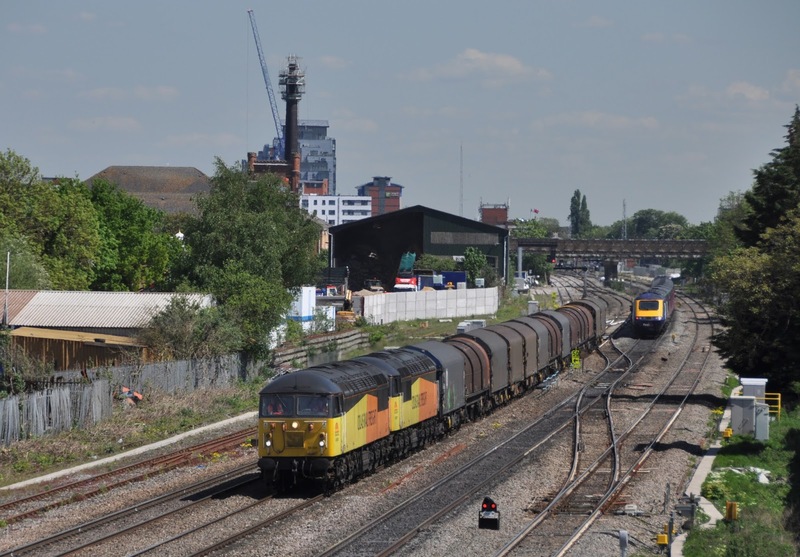 Colas Rail's 56105 and 56078 pass Slough with 6V62 the thrice weekly Tilbury to Llanwern empty steel train on 13th May 2015. The shot was especially pleasing as this was far from my first attempt to photograph the train in the sunshine at this locations- usually thwarted by all manor things from traffic to the one cloud that appears in the sky at the last minute. Even on this occasion a London bound HST tried its best to ruin the view! Seeing pairs of 56's still hard at work in 2015 is a fine sight, though recently Colas rail's refurbished class 60's have also been sharing the work on this train. The scene here will change significantly in the near future as electrification work on the Great Western Mainline continues rendering locations such as this unusable for photography. Already a good proportion of overhead masts have been erected between Reading and Didcot.